The Turkish lady. To which are added, My mother did so before me. Jockey to the fair. The happy beggars. Cynthia's perplexity. 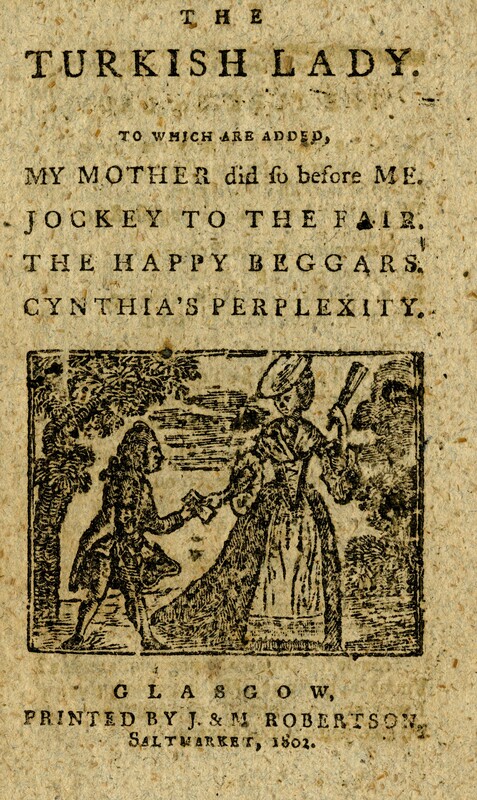 Woodcut image of woman in fashionable dress with a fan receiving a letter on t.p. A collection of ballads and songs on a variety of topics and themes. 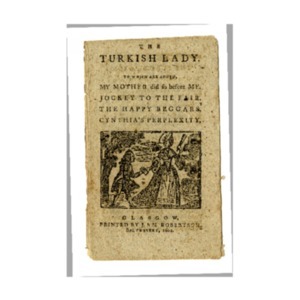 The first tells the tale of a Turkish woman who falls in love with her English slave and consequently becomes Christian and runs away with him to England. The second is a playful song of a young woman who claims she will do as her mother did and flirt and avoid marriage for as long as she can, and to thereafter rule her husband as well. 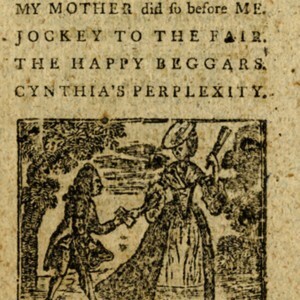 The next song tells of the courting of Jockey and Jenny as he proposes and they run off to the fair, followed by a drinking song praising the life of beggar women as considerably more free from toil and stricture compared to the lives of aristocratic Ladies. The last song criticizes a young woman who will not make up her mind about whether to accept the courtship of a young man, urging her to make a decision before her beauty fades. “The Turkish lady. To which are added, My mother did so before me. Jockey to the fair. The happy beggars. Cynthia's perplexity.,” Scottish Chapbooks, accessed April 25, 2019, https://scottishchapbooks.lib.uoguelph.ca/items/show/559.